In this series of blog posts, we're taking a look at Britain’s favourite pedigree cats. Second on our list is the Ragdoll. A gentle, laid-back and kind creature, this post will highlight some of the basic facts surrounding this lovable breed. The Ragdoll is a relatively young breed. First bred in California in the 1960s, the initial development programme of the Ragdoll selected cats based on their gentle and placid personalities, as well as their longhaired coats. After 40 years, the Cat Fanciers Association gave the Ragdoll full recognition in 2000. Ragdoll are heavier than most domesticated cats and can grow to a sizeable weight. Coupled with the amount of hair they grow, a female can weigh between 4.5 - 7kg. A male can get up to 9.5kg. One of the Ragdoll’s most enduring traits are their love for owners and people. They are well-known for collapsing into the arms of anyone who holds them or snuggling up in a lap. They can also disappear to find a quiet place for a cat-nap and have a reputation of being ‘sofa-potatoes’. That being said, they aren't altogether inactive. Ragdoll's have the ability to learn quickly and can play with toys, communicate with owners and pick up tricks with positive reinforcement. All in all, Ragdoll's are docile creatures that have a nice manner and are easy to live with. Ragdoll's will prefer to remain on a level with their owners and will not seek out the highest points in the room. Increased risk for calcium oxalate bladder stones. Regular check-ups with a vet are essential for the health and longevity of any pedigree cat. If you own a Ragdoll, you’re going to need a brush. A Ragdoll has long fur that needs regular care and attention. It needs to be combed at least twice a week in order to stave off matting and remove any strands of dead hair. Special care needs to be taken around the leg area where matting is most likely to occur. Grooming will also help to improve the bond that you have with a Ragdoll as they enjoy the attention that they receive during these sessions. A Ragdoll's coat will remain plush for most of the year round but will be especially thick during the winter months. It is also important that a Ragdoll’s coat remains clean and free of any dirt/dust. Bathing Ragdoll's at regular intervals every month or so is important in keeping them healthy. Having a clean and large litter box will also help hygiene levels and will give the cat some much needed space. Ear cleaning is also required for general upkeep. Ragdoll's grow in spurts and will develop over the course of 3-4 years. In their infancy, Ragdoll's often have a healthy pad of fat which is normal and natural during these early stages of development. It's important to ensure that a Ragdoll has plenty of food to fuel their growth until they reach a mature size. 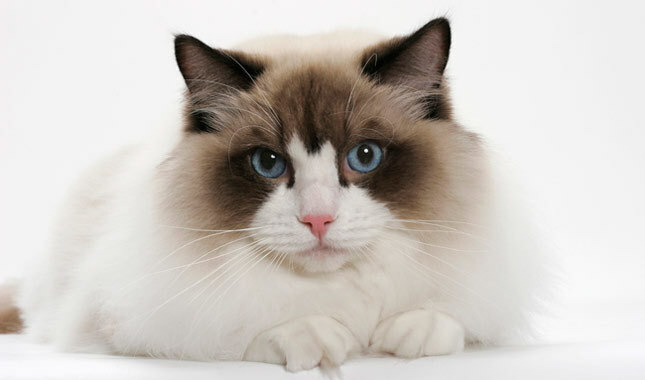 Ragdoll's are perhaps most renown for their vivid electric-blue eyes. They are also heavy-boned and have strong bodies that are sturdy. Their silky coats are another defining trait and come in a vast array of configurations and colours. Their faces tend to have a white-inverted ‘V’ and are relatively short. Due to their placid, laid-back nature, the Ragdoll is an ideal family-cat. They will rarely extend their claws and are willing to be played with. We would recommend that any child is supervised when playing with such a large cat however. It is also vital that a child provides a Ragdoll with the necessary support when picking up. The Ragdoll is happy to live in the company of other cats and is accepting of dogs due to their amiable disposition. Introducing pets slowly into the family is always advisable. With their electric eyes and sweet-natured disposition, it's easy to understand why the Ragdoll is a favourite in Britain's home. For more in-depth information, please visit this webpage.